There are many benefits to having a low maintenance front yard landscaping design. An easy to care for front yard landscape will save you time, money and enhance your property's curb appeal. You can hire professionals or do the work yourself with a little investment of time and money. A low maintenance front yard landscaping design can be very personal and decorative as well saving you significant time and effort in regular upkeep. With the efforts to save energy you can help save water with less grass and this type of landscaping can solve your problems if you live in an area prone to drought conditions. Keeping the amount of grass in your yard to a minimum will save you a lot of time, energy and watering. You will not need to worry about keeping weeds out or fertilizing the grass. You could keep a smaller area of grass and choose from many alternatives for the rest of the lawn. 1. There are a variety of grasses and vines that serve a variety of purposes. These ground covers grow quickly and do well in a variety of conditions. Clover in particular can be an attractive ground cover with its small colorful flowers and it serves as a bug repellant. 2. You can expand your parking area from a single driveway to a double parking area with concrete or gravel. 3. Plant a variety of bushes or trees and use mulch to keep down on the amount of weeds and watering. 4. Planting small flower beds will give your lawn color and you can change the plants with the seasons. There is a variety of bulbs to plant in the fall to bloom in the spring, when these flowers begin to wither, plant flowers that grow well in the spring and summer. 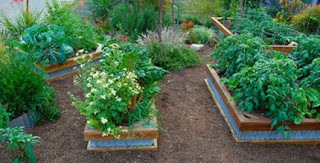 There are also a variety of plants and flowers that will do well in the later spring and early fall. 5. A water feature like a large outdoor fountain will attract a variety of birds and provide an attractive element in your design. 6. Be sure to include the front entrance into your design. The best looking lawn in the neighborhood will not be attractive if the front of the house is neglected. Scrape and paint as well as replace any broken glass or torn window screens. 7. Have a professional install an automatic hidden sprinkler system. 8. Be sure to consider buried lines and any building permits you might need. One of the easiest ways to increase the curb appeal and apparent value of your home is with a good front yard landscaping design. When planning your design keep in mind the style of home, area where you live and the local climate. Carefully planning the front yard landscape of your home will keep it looking attractive any time of year. Belinda Nelson is a free lance copywriter who enjoys writing on a variety of subjects. Each article is carefully researched and put together for the benefit of the reader. Get more ideas and information about easy front yard landscaping by visiting: http://www.hiddentreasuresdirect.com/ Be sure to sign up for your free gift!